Highly Credited and Recommended by BBC, AMC, ITV and Columbia Pictures. The most beautiful Victorian Penny Farthings with the highest skilled riders in the business! Trusted training for Actors and Presenters to ride huge iconic machines from the best. 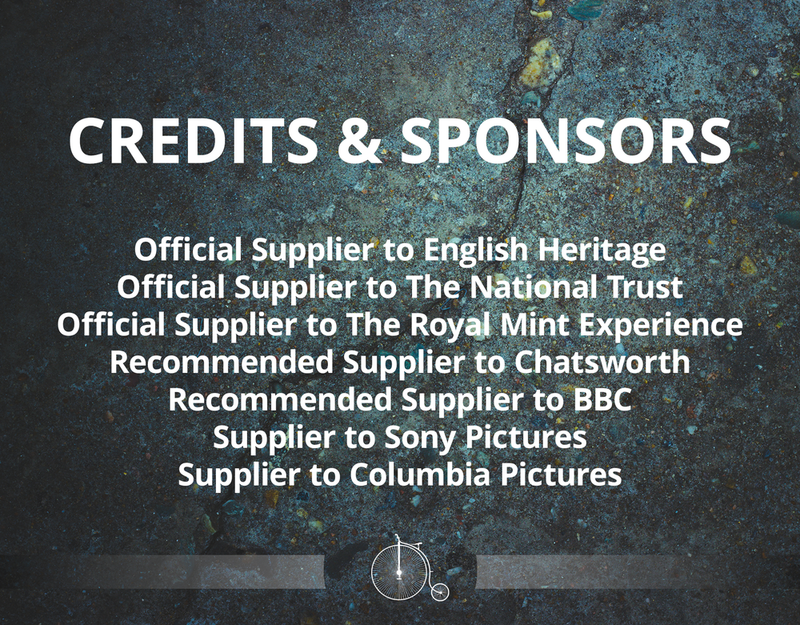 Working closely with some of the best film and television productions, Mr Phoebus has a Highly Recommended portfolio of clients that have received services offered on location across the UK and overseas. The Victorian Machines on hire are some of the finest examples of Victorian transport in the world, supplied unbranded and highly polished and detailed beyond expectation. With expertise in dealing all types of production, our skilled team of riders at Mr Phoebus have years of riding, acting and working to tight production deadline. Both female and Male rider all with upwards of 500 hours of High Wheel and Penny Farthing riding, each having skilled training from one of the best Victorian Cycling experts in the business. We deliver on-location, professional, highest quality prop and skilled rider services to all types of production. Trusted by broadcasting companies here in the UK with The BBC, STV, ITV and Channel Four, and overseas work with Left/Right productions and AMC. Mr Phoebus has skillfully taught presenters such as Paul Laidlaw (STV), Fiona Bruce (BBC) and Norman Reedus (AMC). It has also worked with Advertising campaigns with Giff Gaff, London and Partners and Mc Donald’s. Clients also include Leo Burnett (London), OutsidersTV, Riff Raff, Rogue, AirBNB and Rose Productions. One of the most impressive collections of Authentic Victorian, Hand-built Replica and Modern Penny Farthing Bicycles available for prop and stunt rider hire. Highly skilled and experienced Penny Farthing/High Wheel stunt riders. Highly Recommended and trusted service provider to Television and Film Industry both in the UK and Abroad. Public Liability and Product Liability at £4.8m. Prompt, trusted and effective delivery to on-location production with muti-shoot availability. Agency Accredited stunt riders available directly. Flexible booking terms with bespoke to project price structure. Our prop hire and actor/presenter Penny Farthing bicycle training can happen at any location across the UK and abroad. Mr Phoebus is the specialist in Victorian replica and authentic 1800s circa bicycles, so we have our own delivery and logistic experts. Overseas enquiries must have a lead-time of at least two weeks. As specialists in providing film and period drama productions we also have our own on-location overnight accommodation unit, especially for very early in the day times film shoots. Delivery for UK Productions can be arranged within 48 Hours, subject to availability & conditions. Learning to ride a Full Sized Penny Farthing is a complex and skillful process. Especially the getting on and getting off a machine that can measure over 5ft!. That's why Mr Phoebus has specially designed Training versions of Penny Farthing bicycles that allow training that is easy and effective. From never riding a Penny Farthing, to mastering a machine from the Victorian Era is our commitment in our actor/presenter training services. This has come from years of skilled nurturing, understanding and patience. Mr Phoebus offers skilled riders and stunt doubles for more complex production demands. With years of building this unique business we are confident that Mr Mr Phoebus has the best range of Victorian Inspired Penny Farthing machines. From the most original, exquisite replicas, rebuilt to modern day versions we believe that we have the Iconic Prop your looking for. One of the most experienced Mr Phoebus (Simon Hayford Morris) is available for Film, TV and Advertising production. With extensive experience with The BBC, ITV, Sony, Columbia Pictures and many others, you may have also seen Simon on advertising with Mc Donald's filmed by Outsiders and booked by Leo Burnett of London. Mr Phoebus has a team of highly skilled riders all trained by Simon, both male and female of ages from 18 - 50s. Every one trained with over 500 hours of Victorian bicycle riding. Expertly edited and designed advert by Outsiderstv, featuring Penny Farthing commuter Mr Phoebus. We are ready to talk about your production needs and requirements, with expertise our services are just a few clicks away. What is more iconic than a Victorian Bicycle that towers above the crowds in the background of any period landscape shot!